The Breitling history began in 1884, with its founder the Swiss watchmaker Leon Breitling. Breitling was a master at his craft and the company has followed his lead ever since. This Swiss watchmaker is ultimately famous for their certified Chronometers. These precision instruments were originally designed for the Aviation field, but have mainstream appeal, especially among watch enthusiasts. All the components making up the Breitling creations are Swiss, and every timepiece is manufactured in Switzerland, at the Breitling factory. These are authentic watches, with over 150 years of innovation built in. The Breitling 24 hour Navitimer was born out of an idea from one of the original Mercury Space program astronauts. Scott Carpenter, a fan and one of the astronauts requested that Breitling convert their usual 12 hour dial to a 24 hour one. Because of the lack of day and night in space, it would prove useful…Breitling did just that, and in 1962 astronaut Carpenter wore that timepiece into space. Other extraordinary models were to follow, like the Breitling Emergency, equipped with a radio frequency that actually helped save the lives of two lucky pilots who were downed at sea. Now, you certainly don’t have to be a professional pilot to appreciate these watches. 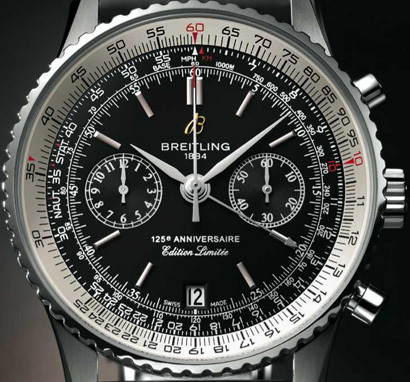 At Breitling, technology rules… and everyone loves that!